The system is easy to use and allows many convenient options, with or without logging in! On the website, click the "Register" link at the top right-hand corner of the page. 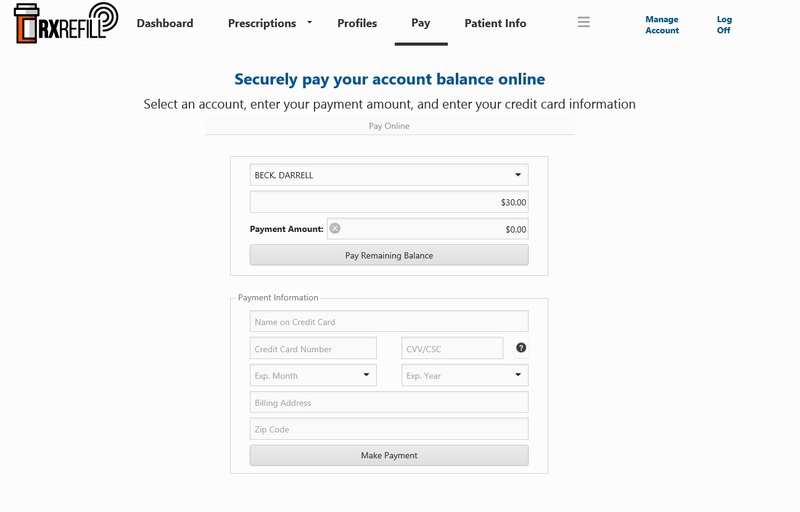 You can immediately log in to your web account, however, you cannot access prescription profile information or request refills until the account has been activated by the pharmacy. You will be notified via e-mail when your account has been approved and activated. *If you do not see the Spouse or Children option, please contact the pharmacy directly to request this option. Let the pharmacy know if you would like to access family member profiles as well. A temporary password will be sent to your e-mail address. Check your e-mail and click on the provided link. If you do not see the e-mail, please check your spam box. The link will take you to the following webpage. Simply input a new password that you can remember. When you log in you will be taken to your patient dashboard. Note: This is not applicable for patients who are not taking medications that need to be monitored. Your adherence "Score Card" is a percentage based off how accurately you’re taking your monitored medications. This percentage is an average of the percentages shown in the prescription list. It is color-coded to indicate the measurement of your adherence percentage. Note that prescriptions not being monitored will not have a percentage value. Your entire family can be linked in one account if you desire. If you would like to link a new patient to your account, or remove a patient from your account, please contact the pharmacy for assistance. *Some pharmacies may not offer this feature. Please check with your pharmacy for feature availability. If you have multiple family members linked to your account, you may want to set a default patient (or member) for the account. 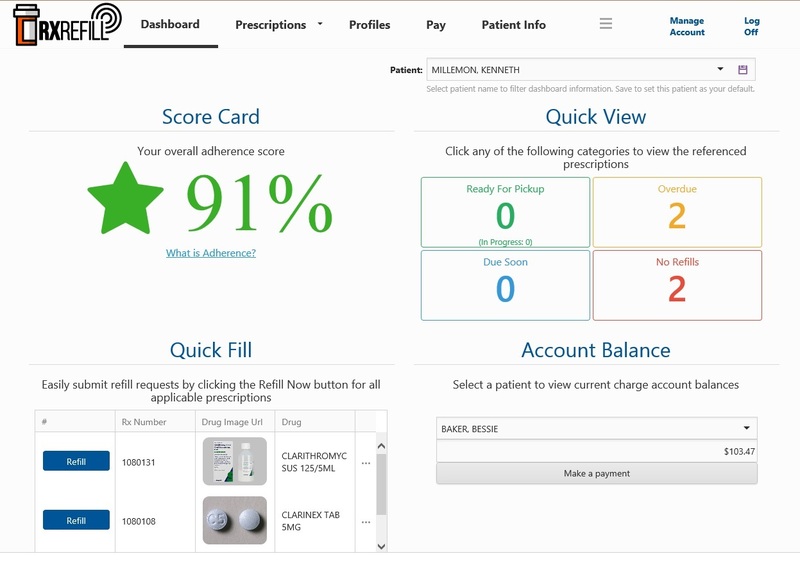 Once a default patient is set, their information will be displayed in the dashboard upon logging into the account. To select a default patient, select a patient name from the drop down. Click the disc icon to save. 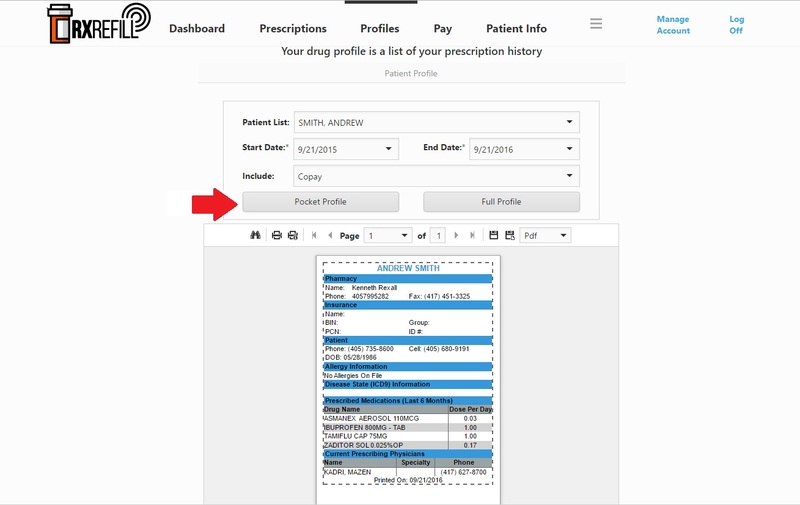 You may select prescriptions to refill from the color coded Quick Fill prescription list. The benefit of choosing from the list is that you can request multiple prescription numbers quickly. If a prescription is out of refills or is expired, the pharmacy will need to contact your doctor. Prescriptions that may be delayed for this reason appear in red. 1. To request refills from this screen, simply place a check mark next to the desired prescriptions. 2. You can even add a note or specify a pickup method. 3. Click "Submit Refills" and your request will be immediately sent to the pharmacy. 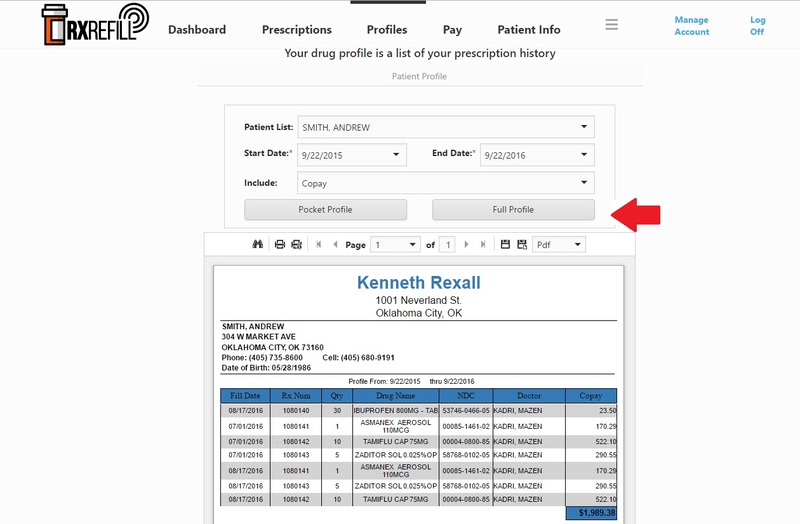 You may also select prescriptions to refill from the color coded Quick View prescription list. This list is also color coded, but allows you to quickly select from four distinct views, Ready for Pickup, Overdue, Due Soon, and No Refills. 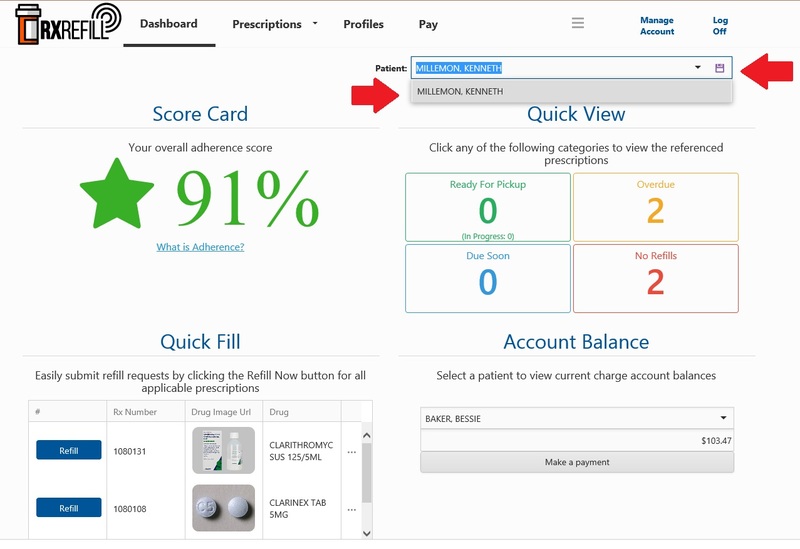 To request refills from this screen, simply place a check mark next to the desired prescriptions. You can even add a note or specify a pickup method. Click "Submit Refills" and your request will be immediately sent to the pharmacy. 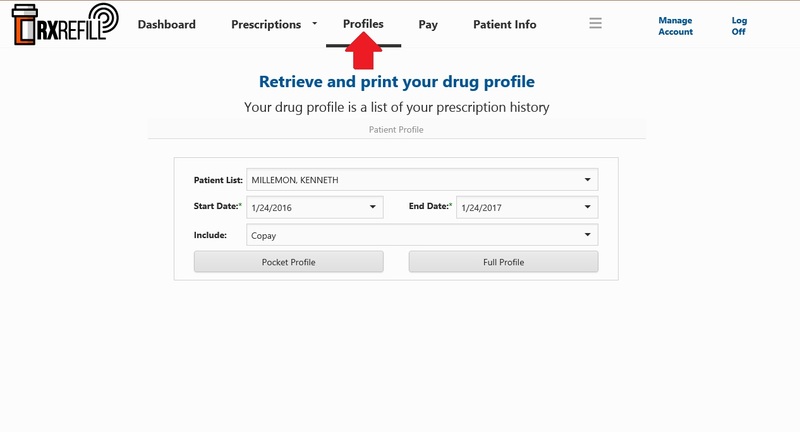 Prescription profiles can be printed online for any patient that is linked to your web account. Each patient profile must be printed separately. Select the patient for which you would like to print. If you have multiple patients linked to your web account, you will need to print each patient’s profile individually. Select a date range. For your convenience, the system defaults one year prior to the current date. Select the type of profile to print. The Pocket Profile is a small format printout that displays the essential information known by the pharmacy in case of an emergency. Information includes your pharmacy contact information, prescription insurance coverage, allergies, current physicians and recently prescribed medications with dosage information. This can be folded and kept in your purse or wallet. The Full Profile is the same profile that our pharmacy prints for you in the store. If you need additional information on the report or if you need the report signed by the pharmacist, then please visit us at the pharmacy. HOW DO I VIEW/PRINT DRUG INFORMATION? If desired, you may view and/or print the drug monograph associated with a drug on your prescription profile. Click on "Prescriptions", then click the "+" next to the desired medication. 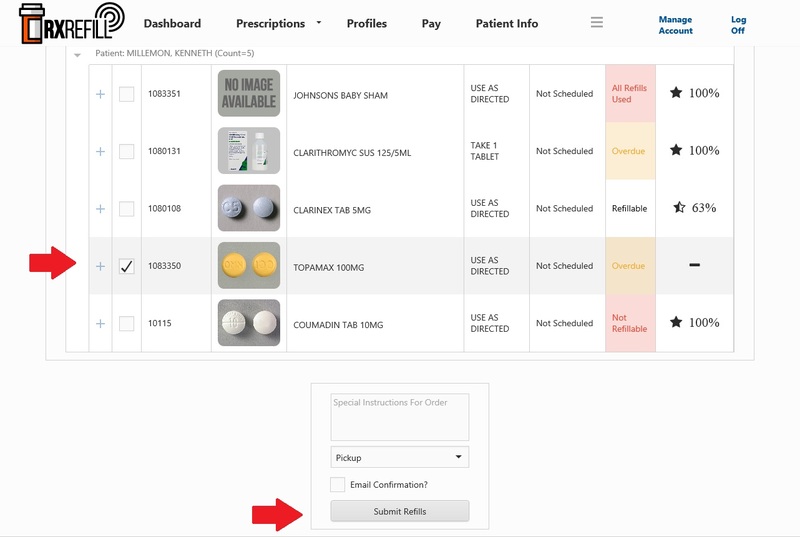 A dropdown will appear with medication information. Click the "View Monograph" button. The monograph will appear in a pop-up window. Press the "X" when you are finished. For your privacy, our pharmacy does not have access to view your password. However, you can request that the password be sent to you via the website. Also, you can change your password at any time from the website. 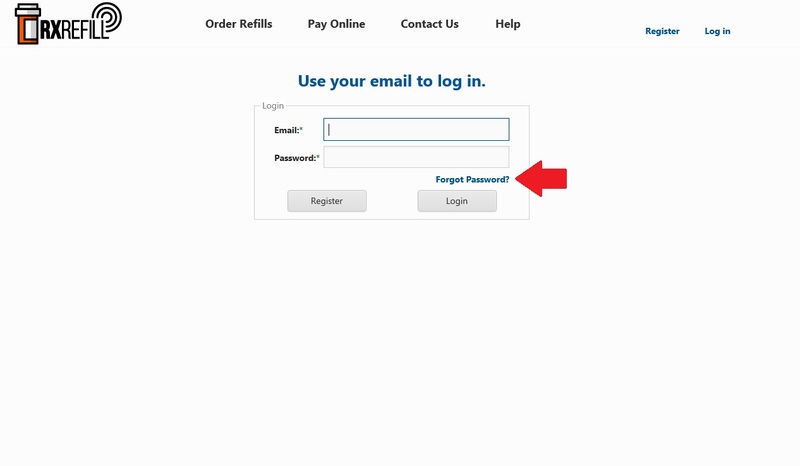 If you have forgotten your password and cannot log into the website, use the "Forgot Password" link to have the system send your password to your registered e-mail address. Log into your email account to view the password. If you wish to change your password, you can also do this from the website. First, log into your account using your existing password. Then, select "Manage Account" in the upper right corner of the screen. Last, type the old password and choose a new password (see above). As a convenience, you may pay your charge account balance from our website. First select the account for which you would like to remit payment. Then, enter your credit card information into the fields and press submit payment. Our website is secure and your credit card is processed by our computer system. Your credit card information s not stored or viewable. Select the account to pay. Enter your credit card information in these fields. All fields must be complete in order for you payment to be processed.